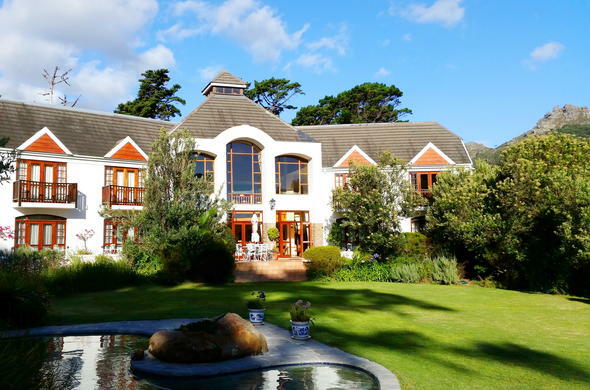 Whether for business or leisure, Tarragona Lodge is perfect lying in the beauty of Hout Bay Valley. Whether for business or leisure, your stay in this elegant country guest lodge in South Africa will be a relaxing and enjoyable experience. There are 10 luxury en-suite rooms, a cosy cocktail lounge and hot and cold swimming pools in an indigenous landscaped estate to make your stay all the more pleasurable. Tarragona also has a fully equipped conference centre. Up to 40 delegates can be accommodated in the conference facility; while team building activities can be arranged as well at this country lodge in South Africa. This Cape Country Hotel is also the ideal romantic country wedding venue. Enquire about stunning wedding packages.